Plein, S. — Greenwood, J. — Ridgway, J.
Cardiovascular magnetic resonance (CMR) has become an established imaging modality with an expanding range of clinical indications. All clinicians working in cardiology or imaging should therefore have a general understanding of the diagnostic information that can be obtained from CMR, the indications for referral as well as contraindications and limitations of the technique. 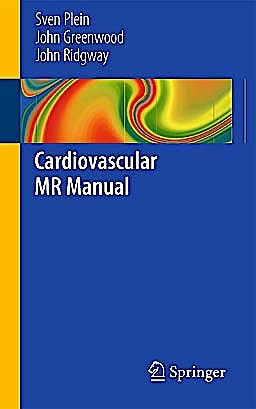 The Cardiovascular MR Manual is a practical and compact introductory text to CMR. It includes a didactic overview of the physics of magnetic resonance imaging, cross-referencing consistently to the clinical chapters and describing the relationship between an understanding of basic MRI physics and producing better images. The authors review the practicalities of CMR from referral to screening, set-up of the study and reporting, including numerous tips and tricks on how the reader can improve the quality of their images. The book outlines the most commonly acquired image components used in CMR and details how CMR is used in clinical practice. It covers the most common referrals for CMR imaging in a structured way with imaging protocols and case examples for each indication. Throughout the book, the authors have used graphs and tables to highlight important learning aspects. The emphasis of each chapter is on providing practical, hands-on information, making this book a key resource for all training and certifying for the use of CMR.